In the last decade, Blogging has been a hot topic not only for creative writers and bloggers but also for small and medium business entrepreneurs. It’s because the blog is the most efficient platform to create own web communities as well as generating traffic, free marketing, and extra sales. Almost every online site page has a blog section included nowadays because of its necessary need. So, here we are. Themewagon is introducing a brand new free responsive blogging template for you. The first thing we are going to talk about Massively is its simple yet elegant and clean design. 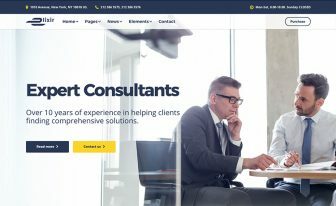 It is a free responsive blogging template that has an eye-catchy design with a simple layout and color scheme that surely make an impression on viewers mind. You can show your contents and posts in such a wonderful way that people are browsing your site will take a tour. It comes with a parallax background which is very much popular and also awesome. 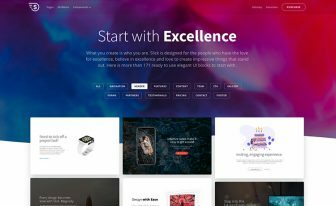 Massively is a free HTML5 website template which is fully responsive and works fine on any devices. From the small screen mobile phones to the large screen desktop monitors – whatever the resolution is, Massively works correctly. Again Massively is a mobile-friendly template. Responsiveness and mobile friendliness are a must criteria for any website as maximum people browse from their phones or handheld devices. 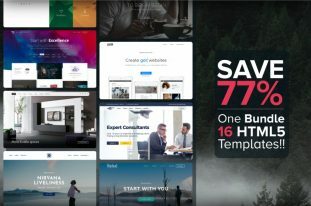 So, people browsing your site from mobiles or tabs will experience a whole site page if you use Massively – a free bootstrap template for your blogging site. But why believe me? Check for yourself the responsiveness on Am I Responsive and the mobile-friendly feature on Google Mobile-Friendly Test or from any of your devices. 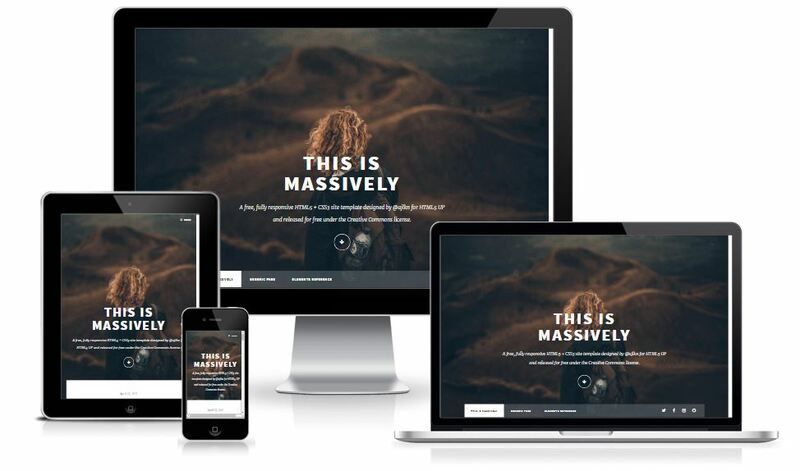 Massively is a well-commented free responsive blogging template. All the sections have starting and ending tag with them. If you have no prior coding knowledge, then you don’t need one too. Because you can easily customize Massively with the good documentation. Just replace the images and texts with your ones and go live. But if you have even a little bit of coding knowledge, it will be a great advantage. You can add or delete any sections as you want and customize it the way you like it. 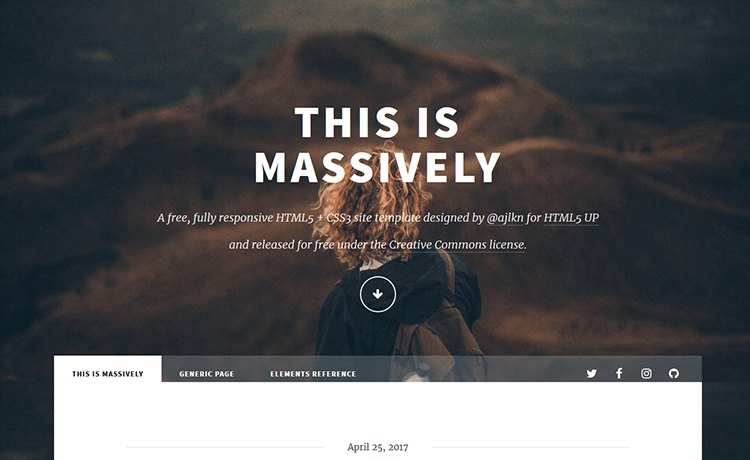 So, go for Massively – a HTML5 free responsive blogging template with premium features. Massively – a free responsive blogging template comes with another great feature. It is SEO friendly. For a good website, SEO friendliness is a must. SEO means Search Engine (Google, Yahoo, Bing and other) Optimizations. When we search for a particular thing on the web, search engines show an infinite amount of related sites and topics. But we only go for those which are on the first page. So, if you have a site and want people to reach out to that site, it must be on the first page or indexed higher. SEO friendliness helps that out. To know more about SEO you can check Google SEO Friendly Guide. As Massive is an SEO friendly free responsive blogging template, your site will rank higher on the search pages if you put your contents correctly. Massively a free responsive blogging template was designed by html5up team. Huge thanks to them. 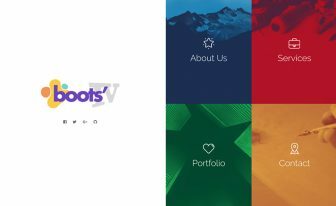 There is a bunch of Free and Premium bootstrap templates in our site. 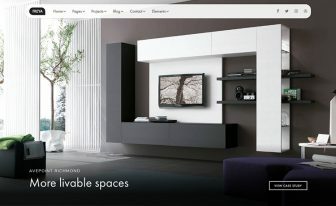 Visit to see the amazing products that are commensurate your project. The only reason I'm entering this here is because I couldn't find a contact area for this company. I tried to install the Massively template after downloading from multiple locations and keep getting, Installation failed due to missing style.css style sheet. I hope someone reads this and updates the file. This one is amazing. code quality is also good. Awesome template. I was looking for a good html5 template and I found it.